I recently did a review on GoNutrition as my first venture in to trying their products. I’d heard a lot about them so thought it’s a good time to get stuck in and try some of their extensive product ranges! 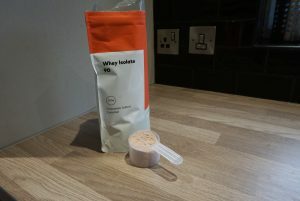 I picked up a safe bet – whey protein powder – because it’s something I use every day and something I can easily compare to other products I use. 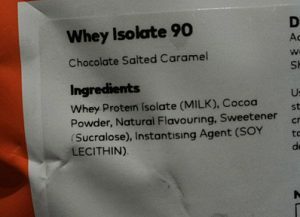 I spent a while researching which product to pick and opted for the Whey Isolate 90 Protein Powder in the Chocolate Salted Caramel flavour. This whey has the closest matching macro profile to what I already use – it’s actually slightly less carbs too. Also the ingredient list is so short I am immediately impressed! I made my order and my parcel arrived as expected! Packaging is the pretty standard resealable pouch and a scoop for the standard serving size. First things first, the smell test! Well not much to report here, it just didn’t really smell of anything particularly, but I take this as a relatively good sign as often these things can taste very chemically. Secondly, I put a scoop in to my morning oats. The first thing that strikes me here is how fine the powder is, I’m not sure this really impacts on much but it’s just worth a mention. Mixability wise it seems pretty smooth and no lumps form so that’s good. Now to the all important taste! This really surprised me but the flavour was quite mild, no chemically aftertaste, not overly sweet. I could taste the chocolate and the salt, but not so much the caramel. If I could describe it in one word I would say mellow. This isn’t a negative to me but it did make me think that perhaps it has less sweetener in it than other brands? I’m not sure, so don’t quote me on that one, but it certainly seems a bit more, I don’t know, natural tasting? Or maybe I am just a victim of marketing? Who knows! I’ll buy this again and I’m keen to try some of the other flavours too!